The Video 25 Plus is unusually light for a Studio / OB head. With its seven step, temperature-independent damping system, professional camera operators capture the naked truth on video or film with perfect clarity. The Video 25 Plus displays an 18 step counterbalance which can be adjusted easily and safely in 9 stages with the well known Sachtler dial. Fine-tuning is achieved via a half step function, which can either be engaged or disengaged. Need to change position? Tilt angles up to 90° are no trouble for the Video 25 Plus, even under maximum load. 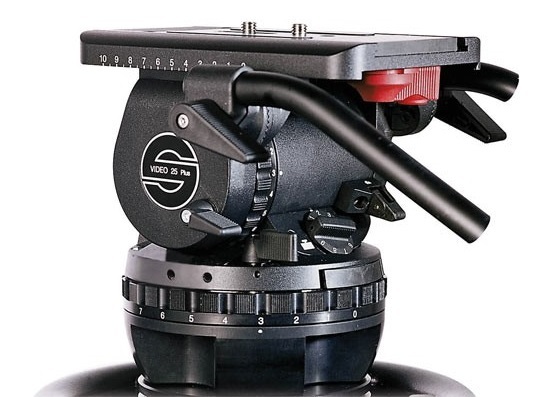 Between others it includes the well-known features from Sachtler, like the Touch & Go quick release system, Self-illuminating Touch Bubble and horizontal and vertical brakes that are conveniently located and easy to reach, for maximum safety in fast-paced reporting situations.